'Turn off the television - in fact, why don't you turn off all the lights except for the one over your favourite chair - and we'll talk about vampires here in the dim. I think I can make you believe in them. 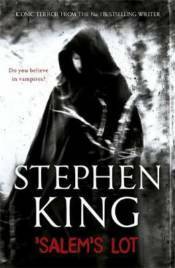 'Stephen King, from the Introduction. 'Salem's Lot is a small New England town with the usual quota of gossips, drinkers, weirdos and respectable folk. Of course there are tales of strange happenings - but not more than in any other town its size.Ben Mears, a moderately successful writer, returns to the Lot to write a novel based on his early years, and to exorcise the terrors that have haunted him since childhood. The event he witnessed in the house now rented by a new resident. A newcomer with a strange allure. A man who causes Ben some unease as things start to happen: a child disappears, a dog is brutally killed - nothing unusual, except the list starts to grow.Soon surprise will turn to bewilderment, bewilderment to confusion and finally to terror . . .